Cells lining the outside of the BLASTOCYST. 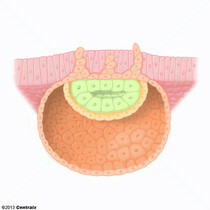 After binding to the ENDOMETRIUM, trophoblasts develop into two distinct layers, an inner layer of mononuclear cytotrophoblasts and an outer layer of continuous multinuclear cytoplasm, the syncytiotrophoblasts, which form the early fetal-maternal interface (PLACENTA). A highly vascularized mammalian fetal-maternal organ and major site of transport of oxygen, nutrients, and fetal waste products. It includes a fetal portion (CHORIONIC VILLI) derived from TROPHOBLASTS and a maternal portion (DECIDUA) derived from the uterine ENDOMETRIUM. 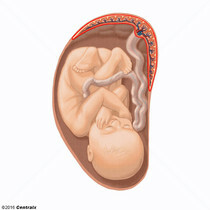 The placenta produces an array of steroid, protein and peptide hormones (PLACENTAL HORMONES).